Caesars Palace is a great place for a family christmas vacation in Las Vegas, Nevada, USA. 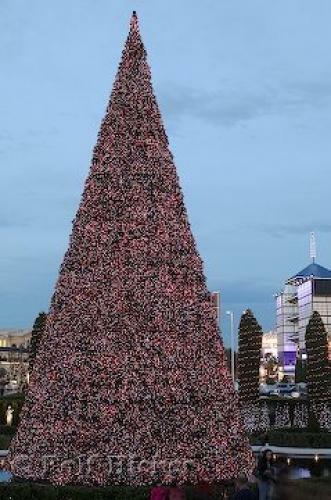 A Christmas tree decorated with a million little lights stands outside of Caesars Palace in Las Vegas, Nevada, USA. The strip in Las Vegas is always lit up with lights and advertising billboards but around the holiday season each hotel adds an outrageous amount of Christmas lights and decorations to make the city of Las Vegas even more exuberant. A vacation to Las Vegas is exciting at any time of year but taking a trip to this amazing city at Christmas is an adventure you will never forget.Caesars Palace Las Vegas Resort Hotel and Casino, Vegas Strip, Las Vegas, Nevada, USA, North America. of Caesars Palace in Las Vegas, Nevada in USA.